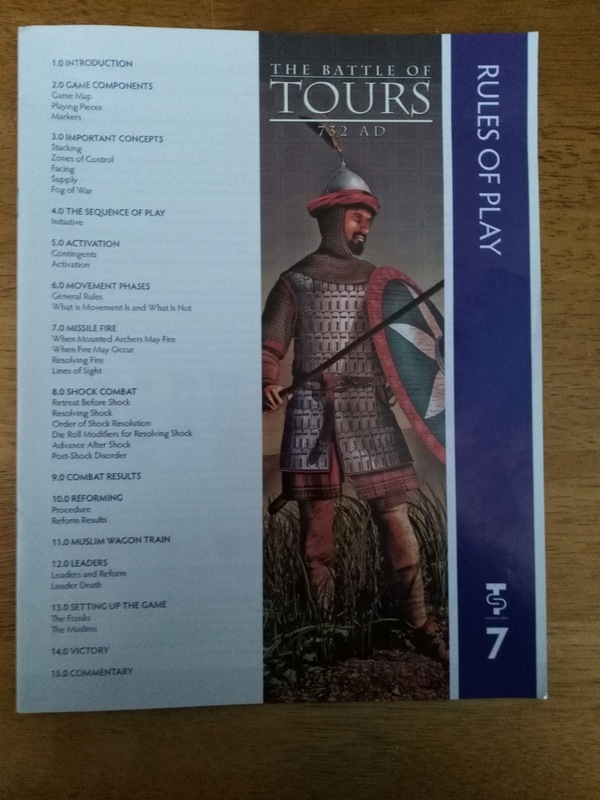 Turning Point Simulations have decided to use Edward Creasy's 'Fifteen Decisive Battles of the World' as a template to bring these different battles to wargamers. So they have developed a line of games called 'The Twenty decisive Battles of the World', adding some newer battles to the list. These game come in boxed or ziploc form. 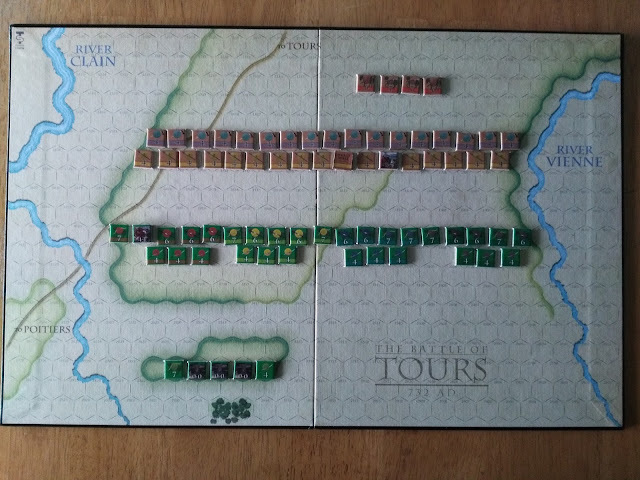 The first game we will be looking at is the Battle of Tours. The battle took place in 732A.D. between the Franks and a Muslim army from Spain. This is the battle where Charles 'Martel' (the hammer) won his nickname and supposedly saved Western Christendom from the forces of Islam. Charles was the 'Mayor of the Palace' for the Merovingian King of the Franks. This victory, and others, allowed his son to become the King of the Franks and to start the Carolingian dynasty (Charles was Charlemagne's grandfather). These games are smaller, roughly the size of a folio game. The map surprised me because it is actually hard backed and not just thick paper. The art work on the map is also well done with the elevations etc. very clear. 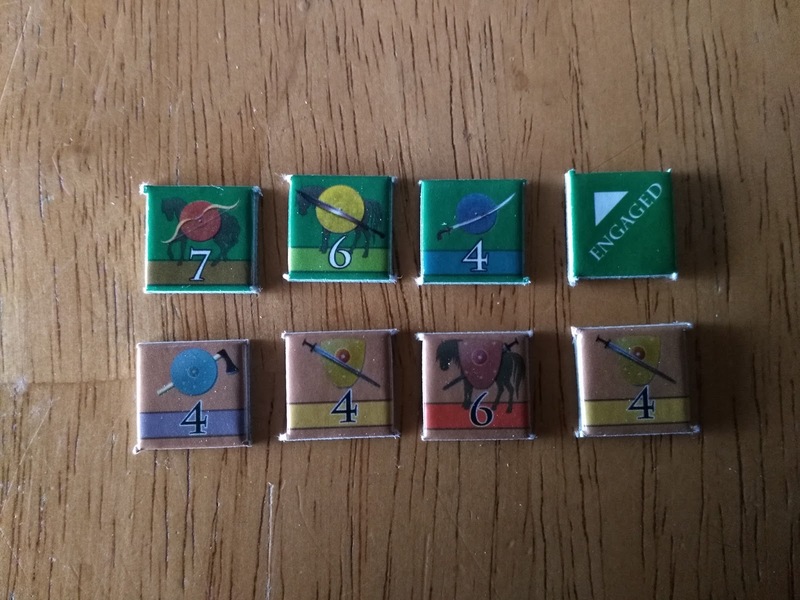 Unfortunately the rule book's pictures of the counters are much sharper and clearer than the actual counters. To me, the background is too dark or the lines of the actual units on the counters are too light. The game rules are only nine pages long, and there is a further two pages of commentary. The back page of the rule book has all of the charts and tables needed for the game. It was designed by the long time and greatly acclaimed wargame designer Richard H. Berg. On the first turn, the Muslims move first; after that a die roll is used to determine who has the initiative. 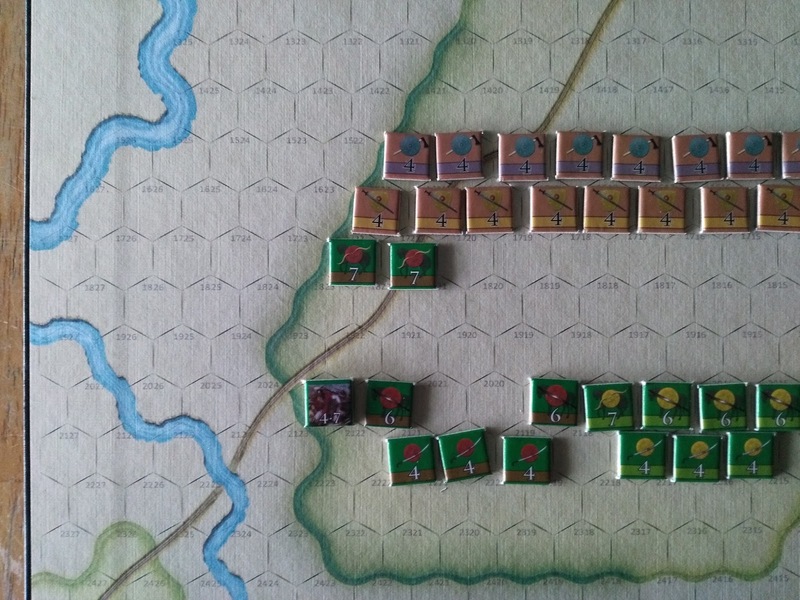 The die roll is added to the overall commanders' command range and the higher number wins the initiative. 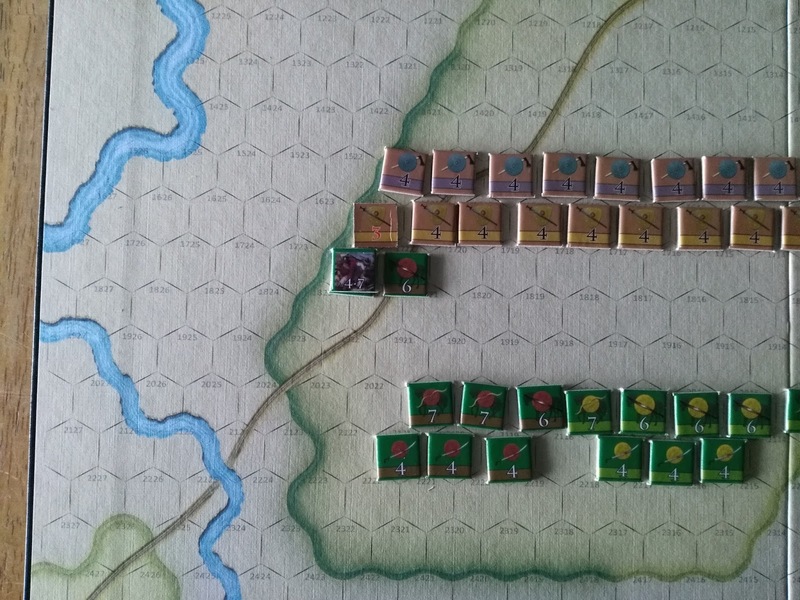 The activation is of separate contingents on each side: Heavy Cavalry or Heavy Infantry etc. Each contingent must pass an activation die roll. One ten-sided die is used for the roll. The Muslims must roll a 0-4 and the Franks must roll a 0-5. Whatever contingent your leader is with gets to subtract -1 from the die roll. Leaders can actually die by fire or shock attack (this actually happened to the Muslim force). The Muslim Wagon Train unit cannot be attacked, but the die roll for the Muslim troops to try to reform is affected. 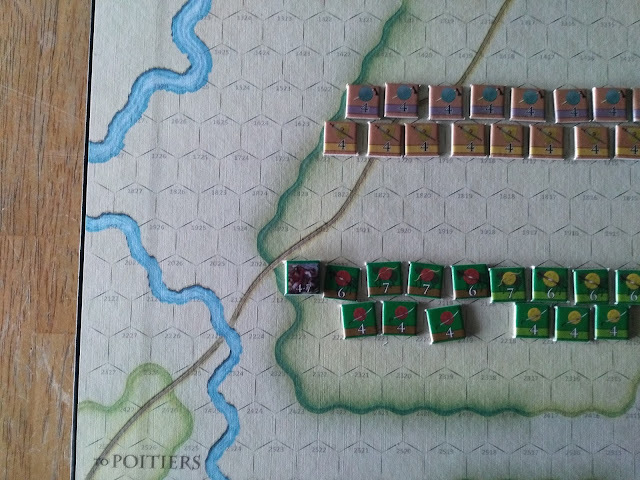 The die roll has +1 added to it if the wagon train is within the movement allowance of a Frankish unit. It goes up to a +3 if a Frankish unit is adjacent to the wagon train. The wagon train was the Muslim booty from their traipse through Aquitaine. 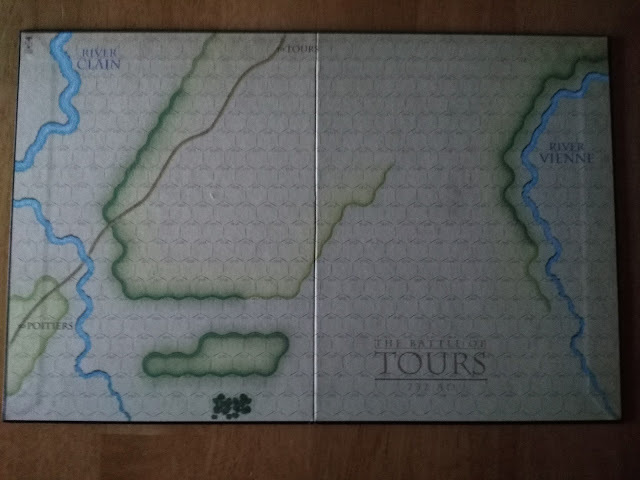 The following is a run through of a turn of the game. The ziploc version does not come with a ten-sided die, but the game has two different sets of 0-9 counters. The Muslims move first on turn one. The left contingent of the Muslim line has passed its activation roll and it is going to move and attack. The game represents eastern archer warfare well. The Muslim light cavalry/archer units can move fire and then move again. It costs one movement point to fire missiles. Both light cavalry fire and then withdraw. The Franks start in a shield wall so that gives a -2 to the roll, and the light cavalry are one hex away so that gives a +1 to the missile die roll. Both units fail to make a hit on the missile chart and move back from whence they came. The two Muslim heavy cavalry units will attack the end of the Frankish heavy infantry line. They get a +1 for having the Muslim leader present (Abd ar-Rahman) and a -1 for attacking heavy infantry. They get a 'disordered' result against the Frankish heavy infantry. The other Muslim heavy cavalry has to attack the other Frankish heavy infantry to its front. It gets an engaged result on the shock attack chart. Victory is determined by whichever side accumulates fifteen eliminated units first. There is a victory check at the end of each turn. The games play out much like a game about Hastings. The Frankish player has to know exactly when to break from his shield wall because of all of the defensive bonuses it gives. 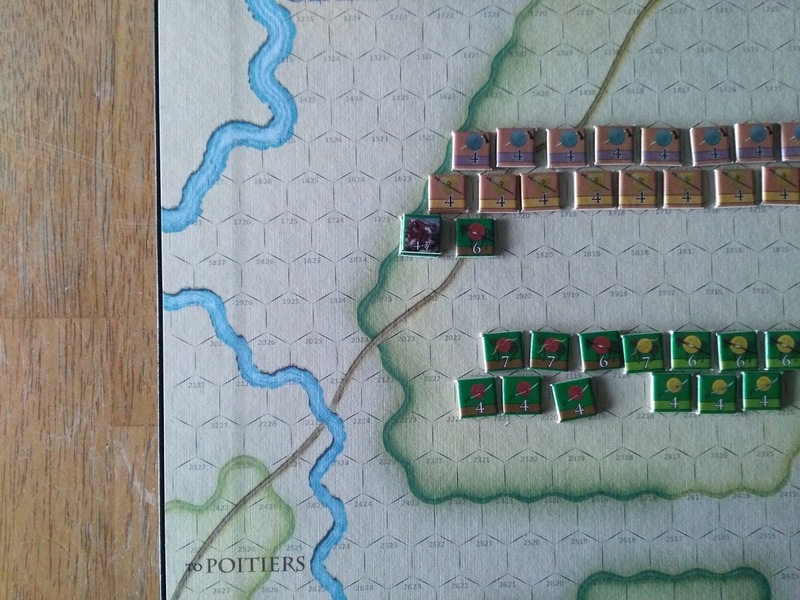 The Muslim player has to hope for good rolls for his light cavalry to cause disorder in the Frankish ranks that he can then take advantage of with his heavy cavalry. If you like the folio type wargames with simple rules and a small counter mix, then this game is perfect for you. I happen to like them, and this game, and I feel it does a great job of reproducing warfare in the eighth century in Western Europe. I believe these types of games have allowed wargaming companies to bring us a much larger amount of battles than would be available without this format. They are also good for the wargamer's wallet.